Hi everyone! If you recall from my last post, I mentioned that on Tuesday we were going to check out the Franciscan Gardens venue. We finally got to see it and talked to Anne (the coordinator) about some of the deetz. It was so much fun to just check it out and at least have an idea about the costs and all that jazz. :D Anne was very cool and easy to talk to. Ironically, a few minutes after having sat down Anned asked us, "So how long have you been engaged?" We responded back, "Hmm about 6 months already!" She replied, "Oh that's great...that means that at least you had some time to enjoy the engagement phase before all the craziness." Anyway, I'll let the photos do most of the talkin'. Oh yeah...The guys get a really cool room with a pool table and all, but the woman's is always more spacious and full of amenities. The bathroom actually had 3 stalls, hah! For some reason I really like this picture! And for today's WIAW from Peas and Crayons. I really enjoy Rudi's bread products because they are pretty easy on my stomach--not to mention, they are all made from wholesome grains. 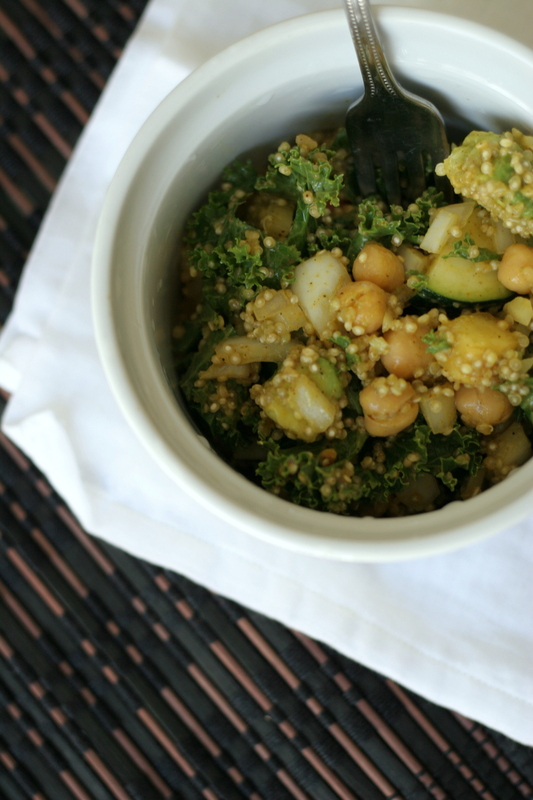 Lunch was a curry quinoa salad since I've been craving and loving anything with curry. First, cook the Quinoa in about 1C of water with a little bit of sea salt. Let it simmer for approximately 15 minutes and then set it aside to cool down. Get all the vegetables and chickpeas washed and ready. Throw it all into a large bowl. Afterward, mix all of the dressing ingredients together until it becomes smooth and thoroughly mixed. Add the cooled Quinoa into the veggie bowl and then add the dressing. Toss it until everything is coated in the sauce. I thought this was a really good combination, and I hope you enjoy if you give it a try or if you like curry! After a great upper body workout (I've been experimenting breaking up segments throughout the week), I made a protein green monster topped with Almond Poppy Seed Granola. I'll share the recipe soon for that! It was also topped with more coconut butter and some of my favorite yogurt EVER next to Fage! Remember when I told you a bit about how much I loved Liberte Yoghurt? Well, I think it's in our family genes because my Momma has been begging me for them and therefore, I cleared off the whole shelf at the store! Haha! I felt kind of bad, but there were only about seven left. By the way, I am sure all of us have heard about all the pain and suffering going on around the world as of late. Obviously there is always something going on! But Britain is truly facing the repercussions of I don't know what exactly, and we can see it through the malaise of the youth's outburst through the cities and the streets. Also, we see that Somalia (as well as a bunch of other nations) is going through excruciating hunger and starvation. There seems to be little hope for these people and in particular, the innocent children who are looking to live just another day--or perhaps...they'd rather not..? Let us not stop thinking and praying for them! I can honestly say that God hasn't caused any of this pain because it is our own humanity that has instigated the lack of opportunity and depravity in this world. However, we can somehow reach out to the hurting and bring them to the One who DOES have the answers--Christ Himself. And perhaps, He is the one that you have been searching for as well. Let's not give up and keep on keeping on! All I know is that although we can't single-handedly transform the world, we can surely show Christ's love unconditionally. I know that not everyone is a follower or Christ or has a relationship with Him, but the fact is that we all live in this world. The president of World Vision, Richard Stearns, puts it so beautifully and eloquently: "All of us who live in this world share responsibility for tackling the world's problems and showing compassion to our fellow man." Have a day that is unceasingly a blessing to others! !